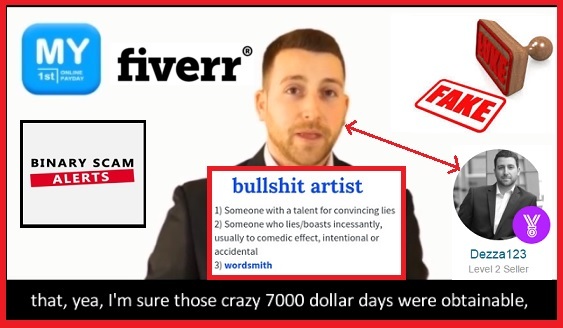 The management and research team of Binary Scam Alerts is issuing a severe SCAM notice and warning in regards to My First Online Payday Software (AKA My 1st Online Payday Autotrader and App) as well as Jeremy Mathews the fake Fiverr actor with a phony British accent. After getting flooded with a deluge of complaints about this so called Auto-trader, we immediately realized this system was not only inaccurate, but also extremely misleading, deceptive, and even dangerous. After conducting an extensive review and investigation, we reached some startling conclusions. Update: My First Online Payday is currently being promoted under the radar by ex-binary options affiliates who are diversifying into crypto scams. My First Online Payday has been caught red-handed by virtue of their own stupidity. The creators of this fake app are obviously on some kind of ego trip, and have lost any perception of reality. When you substitute trading with playing you are taking a serious investment channel and turning it into some type of game. This validates the fact that the app has nothing to do with trading options online. These guys are so full of themselves that they look down at the average working man struggling to make end’s meat, and try to cheat him (or her) out of a few measly dollars. Now, I’m sure that $250 is not a lot of money for these blood thirsty hyenas, but for regular people like your’s truly it can really sting and cause a lot of frustration and anger. In the actual demo below you can see how they are using the software to dupe day-traders with their bogus code. In reality they built a game, but if I really wanted to play I would go the the casino in Vegas or Atlantic City, not push a stupid button on some strange game. And all those news snippets about making money from home, what’s that got to do with anything? It’s about people who have made a serious career change and are now actually either self-employed or working for a company from their own home. So in reality, this APP has absolutely nothing to do with trading and everything to do with gambling your money away. When reality hits, you will not think of what contract to buy or what kind of charting tools you will need in order to reach ~85% ITM Ratio, and it’s not gonna be a discussion about candlesticks, technical or market analysis. Your primary concern will alternate from making money trading binary options online, to how to escape from this scheme with minimal damage to your bank account. Well, it promises to make you money but in reality it’s just like tossing a coin. You have a 50% chance of getting a winning each trade, and they even admit the fact that it’s gambling themselves. So, it doesn’t necessarily take inferior positions, but it’s still rigged and your chances of winning are slim to none. I do have to say that while looking at their code I noticed they were using Angular on a Bootstrap solution. I know this doesn’t mean anything to 99% of the readers, but this is an advanced coding language and it’s a real big shame they are exploiting it to deceive people instead of giving them something profitable. These include but are not restricted to limitless profits, trade tracker pro, the Amissio Formula, Tauribot, Citidel Ltd, Centument, Binary app 810, binary matrix pro, Insured profits with Dave and Ginny, Millionaires Blueprint, The Free Money System with Walter Green, Copy Buffett, Trade Tracker Pro, and Tradefusion. You can find a new system sprouting in every corner, in reality very few actually work. We endorse the Binary Profit Method as our preferred signal solution. If you are searching for a trading bot please read our Virtnext review. Yes, but you must fund a broker account with a minimum amount of $250. It is our humble opinion that there is nothing genuine, honest, or sincere about the My First Online Payday software and trading app. To be completely honest, we were not able to identify it as a bot, signals, or copying solution. It is such a far fetched product that it doesn’t even fall under any known category. We are officially declaring this system to be a binary options investment scam, and Jeremy Mathews the ring leader of this crime. If you have fallen prey to this vile scheme, please make sure not to re-invest. If you have not invested yet, consider yourself lucky and run back home quickly. If you liked this review don’t forget to like our Facebook Page and subscribe to our YouTube Channel.